Today, we visited Salzburg, and were very lucky to have a tour around the city by Michaela our amazing guide. She took us to churches, statues and locations from where The Sound of Music was filmed. I especially liked walking through the pretty square where part of “Do Ray Me” was sung and you can see some Sound of Music references in our video! Salzburg is full of stunning Baroque architecture, and we loved looking at all the incredible buildings, especially all of the churches. There are lots of religious places to see in the city, but my favourite was the church where Mozart was baptised. It was absolutely beautiful, and the walls had lovely black and white decorations. Mozart lived in Salzburg, and his presence was everywhere. Salzburg is the home of Mozart chocolates which (happily) were in almost every shop, while you can also visit his old house and see a statue of him. I was lucky enough to find a huge doughnut pretzl in the Salzburg market. After this, our family took the cable car up to the fortress, which had lovely views over the city and was also full of history. Next, we took the bus to the lovely palace of Hellbrunn, built in the 17th century, and which has lovely grounds and even boasts the pavilion where the song “Sixteen Going on Seventeen” was filmed for The Sound of Music. Instead of exploring the rooms, we opted to go to the trick fountains, which we all loved. My brother got absolutely soaked. Hundreds of years ago, the Archbishop loved inviting friends to his palace, but always tried to liven up their visits. By placing surprising fountains around the gardens, he would shock them and get them soaking wet! On Friday, we went cycling again. First of all, we went to tobogganing centre in Strobl, passing a clear blue lake with people swimming in it on the way. It was gorgeous, and I thought it was amazing how unpolluted it was! In London, a lake like that would be brown and full of rubbish! The tobogganing was lots of fun, and Rob especially loved it. You went up really high before sliding down the hill very quickly, and half of the time you were practically riding on the wall. Each go took a very long time as going up the hill took aages. There were two different ways you could go down; one was short and fast, and one was longer and slightly slower. You also got to control how fast you went by pulling a lever on the board you were riding on. Next, we cycled 14k to St. Gilgen at the top of the Wolfgangsee, which looked sublime. It was another hot day, and we quenched our thirst with lemonade and a really bitter lemon drink that everyone hated but me! This swing in St Gilgen has a beautiful backdrop! After a brilliant pizza, we took a look around the shops, got cream cakes from a bakery and took a ferry back to Strobl. So that was our fabulous holiday for the summer. Even though we spent a lot of time running, swimming and cycling, I still felt really relaxed and refreshed throughout the week, which is something that does not normally happen to me. The holiday was very different to others I have been on, and is definitely one of my favourites. Funnily enough, I had never been cycling for longer than half an hour before, but the holiday really helped me to improve my confidence, and there were not too many parts of the journeys that were uphill. I would 100 percent recommend this holiday to anyone – there seemed to be something for the whole family and I honestly cannot think of anything bad about it! The sights were incredible, the food was fantastic and there was loads to see and do. I wish that we could go back next year! Disclosure: our tour around Salzburg with Michaela Muhr, a licensed guide, was complimentary and you can book your tour via the Salzburg Experience website. All the views and opinions about the tour and the city are our own. Disclosure: we were offered a discounted media rate for a Headwater cycling holiday to Austria. However, all our views are entirely our own. For August departures this year, Headwater would have charged: £1038 for an adult self drive including Eurotunnel (child under 12 sharing £599), £1238 for an adult flying with with BA from Gatwick-Salzburg (child £819) and £1029 for an adult tour only (child £619). This is for half-board accommodation, including transfers, plus the bikes! 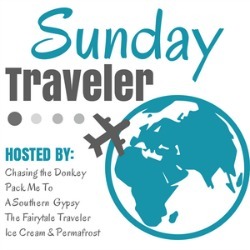 This week we’re part of the Sunday Traveler (or traveller as we would write in the UK!) where you can link up and read about travels around the world. It’s hosted by by the lovely Sarah-Jane at Chase the Donkey! That sounds like a really enjoyable holiday, something for everyone and also a little different from many summer breaks. 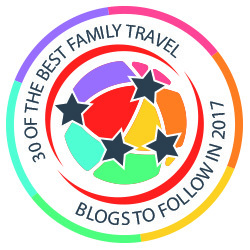 I would love to go to Austria – maybe your post might help me persuade the rest of the family! It really was such a lovely place for a family holiday and, as you say, different too. I bet the family would love it! It really was. And am sure you would have loved the cycling!! Holy doughnut pretzels! Austria is somewhere I’ve always fancied visiting – one day maybe! Haha – the pretzel was delicious. We had an amazing holiday; Austria is beautiful! I’ve only ever flown in and out of Salzburg. I love Austria and this looks like another fabulous place to visit. Salzburg is wonderful and Austria is lovely – I would definitely recommend a trip there. Austria has always appealed to me and your photos make it look absolutely beautiful. As for that pretzel, I want one now! Do you know what? I didn’t even get any…I think Jess and her Dad managed to polish if off in record time! This sounds like a really great trip, especially the cycling and tobogganing. And I’d love to go to see where The Sound of Music was filmed as it’s one of my favourite films. It looks like an amazing trip. Such beautiful scenery and so much to do. I’d love to visit myself. It really was breathtaking – some of the best views I’ve ever seen in my life! There is so much of Europe I would love to see – Salzburg looks just beautiful! It really was, and there was just so much to do. We really needed more time to explore the city, as it was fantastic! That is really terrible! It’s a great city (perhaps not as beautiful as Vienna though) and the whole area is gorgeous. You will DEFINITELY have to go back! I went to Austria in HS. It was a really fun trip. And I loved Salzburg. It is such a beautiful town. Wow! Looks beautiful. Salzburg is one place I so want to visit. What a brilliant trip – Austria is one place I’ve really hardly been to. I love the look of those doughnut pretzls! I love Salzburg! It’s a great city to explore and I would love to go back. That lake colour is unreal. So awesome that it is unspoiled. Thanks for linking up to the #SundayTraveler! It was just so beautiful, and we were amazing by how clear and green the lake was. Salzburg was fantastic, and I would love to go back again.